An arch-conservative political machine will be down one billionaire but have more clout than ever. ".. promising to spend an estimated 3 to 4 hundred million dollars during this fall’s midterm election." 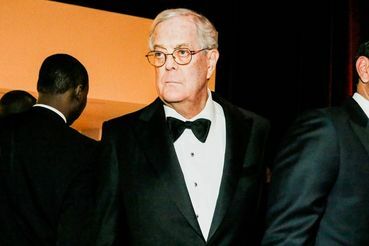 Nearly forty years later, many of the Kochs’ policy preferences are now standard Republican orthodoxy, having been promoted from the fringes into the mainstream by the dozens of nonprofit organizations and candidates they funded. Small government, anti-tax, anti-regulatory, and pro-privatization policies, as well as skepticism regarding global warming, are commonplace. I say, now if Charles would just go away…. Actually, their offspring will probably carry on their activities when both brothers are gone. Also, the article points out that their foundation wing, Americans for Prosperity, will no doubt carry on their torch indefinitely. TYFS, Judy Greed is truly a dirty business. That's a good question, Peggy. Koch Brothers...? -I'm not allowed to say what I think of those stinking rich, greedy bastards! I guess David will progressively look more and more like he is biting lemons, and Charley's s**t-eatin' grin will get bigger and bigger. Excellent article, fully explaining how dangerous the Koch's are. Not that we didn't know already. Thanks for the post.